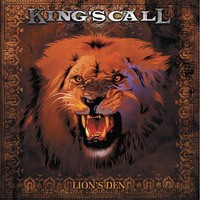 KING´S CALL may not say a lot as a band name but the band has released three albums including this one since 2008, and these days they sport Mike Freeland as their vocalist. “Lion´s Den” was produced by Chris Tsangarides (BLACK SABBATH, GARY MOORE, JUDAS PRIEST etc.) and mixed by Dennis Ward of PINK CREAM 69. The rest of the band is Alex Garoufadilis, guitars, Azerbaijani Asec Bergemann, drums and Andreas Kramer, bass. I do think that KING´S CALL are familiar with their eighties idols, and that they went for a sound somewhere around the NWOBHM or thereabouts. When they head for Britain in the early eighties they produce their best material. Songs like “Riding the Storm” and, especially, “Holy Ground” are top of the game. Keeping a British sound in general awards them “Mother Nature” and “Avalon”. But then there are the likes of “Dig It”, the mixed “This Is the Life”, the attempt at making Coverdale music with “Get Up” and the Beatles track “Love Will Find a Way”, the latter outstays its welcome at 7.10. I really wanted to love this one, and don´t dislike it, but it really isn´t the high that Mike Freeland deserves.